Congratulations! You’ve completed ten lessons in oil painting. Now you’re ready to start painting. Before you start the oil painting tutorials, we've gathered some important information for you to get set up and ready to paint, including a video on toning your canvas. Note that some videos may have ads before them. You can sometimes skip the ads by waiting five seconds then clicking "Skip Ad", but if that option isn’t available, you can check your text messages/Facebook/Twitter feed for 30 seconds. Or just be patient. If you like, you can always open the YouTube video in a separate tab in your browser to make it simpler to switch back and forth between the video and the text in our lesson. To do this, simply click the YouTube button in the lower right hand corner of the video that's in the lesson. This will open the video in a new tab on YouTube. We recommend watching the video in full screen mode. For more information on YouTube video watching, see our Being A Successful Student post. For information on translating YouTube's closed captions, see this post here. 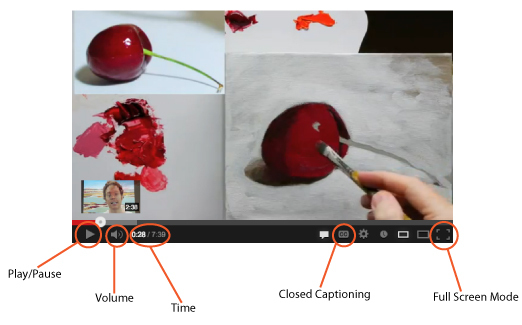 For information on YouTube's Closed Captioning, see this post here. In this five-minute video, Don Stewart will walk you through toning your canvas. We also talk about painting on a toned surface in Alla Prima Painting. The reason you want to work on a toned surface is so you can properly gauge your lights and darks. He explains some of the reasons he likes working on a toned canvas in the beginning of the video. Our oil painting instructor, Cynda Valle, refers to this step as "killing the white". Don Stewart is using a Burnt Sienna to tone his canvas. This is a very common color to use. To begin toning your canvas, squeeze out a dab of your Burnt Sienna or Burnt Umber. Mix it with a lot of solvent to make a very runny consistency (about 30% paint to 70% solvent). Brush this onto your canvas with a large brush. Once you’ve covered the whole canvas (don’t forget the edges), you can use a clean, dry rag or paper towel to rub some of the paint off and create a uniform tone over the whole canvas. The goal is it to be a medium tone—not too dark and not too light. If it’s too dark, you can put a little solvent on your rag and wipe the surface of the canvas again. This toned layer should be transparent because the transparency will allow light to reflect off of the white surface underneath and bounce back through your paint, creating a luminous quality. Don Stewart suggests leaving your canvas to dry for at least 24 hours and up to several days. If you have the time to do this, then go ahead. Sometimes I get excited to start a new painting and will tone it just before I start painting. Rubbing the paint in with a dry cloth helps it to dry quickly, so as I’m figuring out my composition, getting my palette setup, and putting together my tools, it will dry somewhat and I can start painting on it. Doing it this way is fine, but be aware that when you sketch in your drawing with thinned-down paint, your tone may lift off the canvas. If I’m feeling particularly productive, I will tone a bunch of canvases in one day and leave them all to dry for when I’m ready to paint next. This is really the best way to go and it’s a good thing to do on studio days when you’re not exactly sure what to paint but want to feel like you’re still doing something useful (“productive procrastination”, I like to call it). Remember, you can always go back a few lessons if you need reminders on how to lay out your palette or clean your brushes. Move your painting to another area. Take it off your easel and prop it up in another room in the house. You won't have the temptation of brushes and paint in another room so you can view the painting more objectively. Ask opinions. Get the opinion of someone else. Do they think it looks finished? This can be hard to ask of someone else--as artists, we often feel very vulnerable doing this. Sometimes, though, it's best to get the fresh eyes of someone who hasn't been looking at the painting for a long time because they'll notice something that you overlooked because you were focused on another piece of the work. Be brave, ask for opinions, and have confidence in your work! You can use any size canvas with the following tutorials, but the bigger the canvas, the more freedom you have to move and paint without getting too fussy with your details. We would suggest no smaller than 8” x 10” which is what is listed on our Traditional Oils Recommendation List and WMO Recommendation List. Don’t feel like you have to finish the painting in one session. Remember, you can always come back to your canvas later. Don’t worry about how long it takes you—it took Michelangelo four years to paint the ceiling of the Sistine Chapel! The next four lessons will get you started with painting. Of course, you can skip around if you like, but we’ve ordered the videos in the way that we feel will best suit the new painter. We've set up each video lesson in 10 - 15-minute parts that each take up to 1 and 1/4 hours to complete. This time includes approximately 15 minutes to watch that part's video, and 10 minutes to lay out your paints on your palette and post painting cleanup. These times may vary from student to student depending on your individual pace. Take your time, don’t rush, and if you need to stop you can. If you have more than an hour to spare, then work as long as you feel comfortable! We suggest those who have trouble hearing the instructor use the closed captioning (CC) feature during their initial viewing of the video. Our CC experience is that they do a very good job capturing the instructor's words---but do expect some humorous misses now and then! If you feel like you need help, write into the comment section of each lesson. We’d like to see your progress! If you feel you’ve been successful with the paintings in the lessons, send them to us using our submission form. If you need more instructional videos, you can always check out the Student Resource Center for more tutorials and information. Key Lesson Learning: You’ve learned information about getting ready to paint with oils and the importance of toning your canvas sometime before your painting session starts.